Now-a-days there are so many online for educational resources, among in these online some includes PDFs articles or presentations more are based on visualization of tutorials. We should be very much thankful to the National Science Foundation, The Science360 is a Video Library with latest wonders of science, engineering, technology and math. The latest science videos provided by scientists, colleges and universities, science and engineering centers,the National Science Foundation and more. Each video is embedded to put on your own personal websites,blogs and social networking pages. 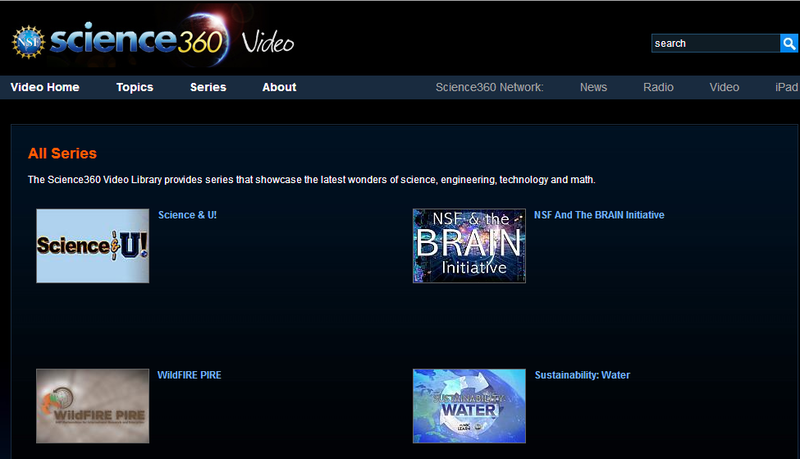 Science 360 engages the general public, science junkies and students alike in the cutting-edge discoveries and big science stories of the day. The main page will show a Featured series of videos to be accessed randomly mixed, but the "topics" we divided the content in astronomy, space, chemistry, earth and environment, life sciences, mathematics, medicine, and more categories in which we find all kinds of videos. that include government agencies, not-for-profit organizations and private industry. 3. iPad : The National Science Foundation's (NSF) Science360 for iPad provides easy access to engaging science and engineering images and video from around the globe and a news feed featuring breaking news from NSF-funded institutions. Content is either produced by NSF or gathered from scientists, colleges and universities, and NSF science and engineering centers.